The Rebel Sweetheart. : Wordless Wednesday #58 | Adventure Time! 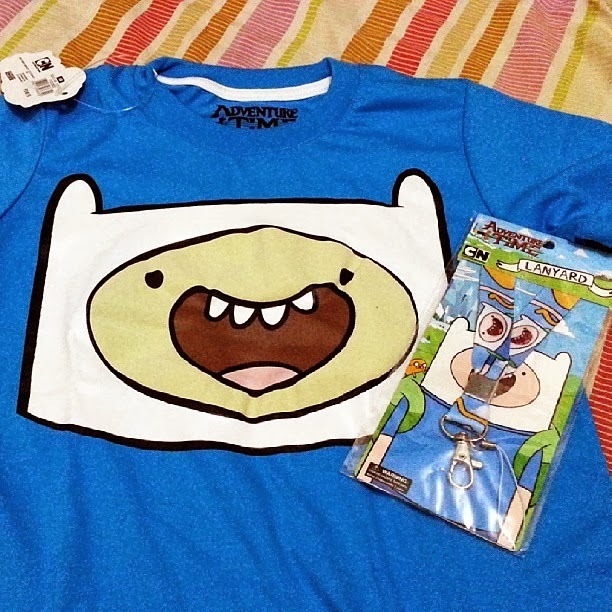 My boys love to watch Adventure Time on TV.. nice presents. What a great reward for doing well in school. My children really like that show. I prefer Regular Show. Wonderful prizes. I'm sure he'll love it. I know some people that love this show! Never saw that show, my friends kids are all grown up now. But I can see how a child would love that image. I am very happy for you that he is doing so well in school!! How cute! Great job to the little man! Rewards for things like this are great! I know my lil ones would <3 that T-Shirt! What an awesome reward, and congratulations to your little man for working hard and getting good grades. Very cute! I am so glad you are not rewarding him with food. I have two boys and their Lola is always rewarding with food. I am afraid it will lead to problems with weight later. My comment just disappeared so lets try again. I think that the shirt is very cute. I am glad that you are not rewarding with food. I have two boys and their Lola is always rewarding with food and i fear that it will lead to weight problems in the future. I've never really seen the show, but that is one cool shirt! Awww... very cool! I love Wordless Wednesdays! My daughter doesn't watch this show but I do!! !